Apollo is known for producing high quality electronic cigarettes, but they also ventured into building higher powered eGo and MOD Personal Vaporizers and have been very successful at it. The Apollo VTube 3. is the latest revision of their VTube MOD kit (Lavatube and Lambo 6.0 are similar clones) and coming in at an affordable price, it hits the mark and competes against the best MODs very well, being that is its fully variable on voltage output. This is a solid stainless steel unit that has seen great improvements with each updated version, making the V3.0 updated and free of previous issues. $119.95 Coupon: campus10 10% OFF! 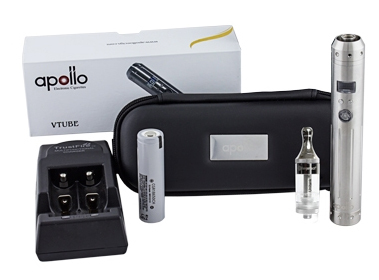 Apollo's updated and completely refined VTube 3.0 kit is sure to satisfy anyone looking for a high powered personal vaporizer that offers all the customizing and variable power options available with a very easy to use system. The build quality leaves little to desire. Copy & Paste Coupon: " campus10 " at the checkout for 10% discount on all purchases. The V1.0 of the VTube was criticized for having a cheap build and the V2.0 tried to address that by upgrading the casing to stainless steel. Additional upgrades featured metal caps vs the old plastic ones, spring loaded floated center pin and eGo threading. The second revision had identical components inside and operated just the same. Many users complained of too much airflow on the draw, making it overly airy when puffing (this can easily be fixed with an adapter) as well as badly made 510 connections that we’re too wide to properly fit many popular clearomizers. Also being that electronics remained the same, the High Resistance Atomizer had a 2.5Amp limit on the circuit board. This was a huge issue as most high resistance atomizers need a minimum of 3Amps, making it mostly compatible with Low Resistance Atomizers only. Overall build was still considered improvable, such as small plastic plus and minus buttons that have too much space to move around and make a noisy rattle. After many customer complaints, Apollo improved the cloned MOD into their third and more proprietary V3.0. The brushed stainless steel finish was improved and leaves less fingerprints. New grooves around the handle allow for better grip. The device is just a tiny bit longer in length but features a noticeably bigger negative LCD display with a curved clear viewing window. A considerable improvement on the old red backlit LCD, but we still found the negative type display be a bit difficult to read in strong sunlight. The plus and minus buttons remain small, but the main power activation button is well built and glides well for no sticking or misfiring. The positioning of the V3.0 button is an improvement from the V2.0 and is also bigger in size. The end caps we’re also greatly improved and are much wider in depth with 5 air vent holes at the bottom of the cap. The battery spring is much stronger and durable as well as being gold plated. As far as the circuit goes, everything was also revamped. Now running both Variable Voltage and Variable Wattage, it now has a 5Amp limit, meaning it could handle bigger dual head cartomizers without breaking a sweat. The 510 threading base was also improved with a removable top cap, to fit big tanks with ease. Additionally, the spring loaded pin is gone, in favor for a better engineered fit. Many swear by self-adjusting spring loaded cartomizer pins, but if they are built cheaply, they also get stuck with time. So we went over all of that for those whom had purchased previous VTube V1.0s and V2.0s, because many of those issues are no longer with the new model and reviews from users remain good many months later after purchasing the device. They fixed the problem and made this a more unique model. As you may know the LavaTube and Lambo 6.0 are very similar, but they do have some small differences, such as the removable top cap. 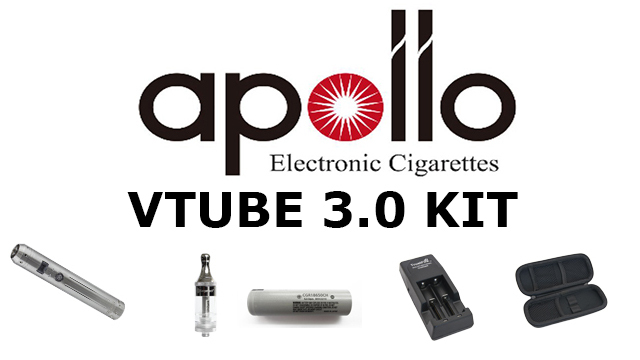 The fully Improved Apollo VTube 3.0 now runs a powerful 5Amp circuit and both Variable Voltage and Variable Wattage. Volts can be increased or decreased in 01. Volt increments from 2.0 to 6.0 volts and Wattage power can range from 1 to 20 Watts in 1 Watt increments. 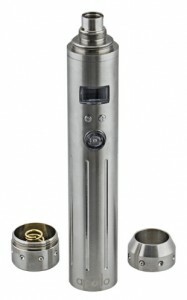 A huge improvement here, this device will handle dual head atomizers really well. Apollo includes a Panasonic high capacity 10amp 18650 batter at 2250mAh and it does a fine job. Although a 20-30Amp battery range may give slightly better performance with variable wattage settings, but after testing it, it seems to do pretty well with the 10A battery. But it’s something to note if you see gradual loss of power, it may be beneficial to use a little more power on the battery end. Previous versions of the VTube MOD had limited space on the eGo thread base to fit big tanks at times. On top of it, it had issues powering dual cartomizers. Apollo went the extra mile and re-engineered the top thread base to have a removable cap to fit various tank and cartomizer sizes. The Apollo Unitank is included with the starter kit but you may also add an additonal ProTank 2 as an option. One cool thing is that Apollo does offer a full array of tanks to fit a variety of devices, giving you the choice to stick with Apollo tanks if you want to. Menu operations are really easy with the Apollo VTube. It does not require to remember many button press counts to scroll around. Press 5 times to turn it on/off is about the only one, you can quickly check atomizer resistance by holding the (-) minus button and hold (+) to read battery voltage. The fire button allows to change from Variable Voltage (VV) to Variable Wattage (VW) by pressing it 3 times and you would use (-) and (+) to adjust, of course. The Variable Voltage mode does not restrict your voltage level based on the atomizer resistance, giving you more freedom to fine tune and dial in the perfect settings. Variable Wattage on the other hand, will automatically adjust the voltage for you according to the detected atomizer resistance ohms. This helps provide optimal performance but you may still need to find the best wattage to use with any coil and tank combination. Up to 20 Watts of power is impressive but it is limited to 1 Watt increments, leaving little room for fine adjustments. Having the 5A circuit means you can use many atomizers even low resistance models but Apollo advises not to use very low resistance atomizers at the risk of voiding your lifetime warranty. Apollo gears you up with a Stainless Steel VTube MOD, Panasonic high capacity 18650 battery, Trustfire dual wall charger, leather carrying case and a Unitank Clearomizer. 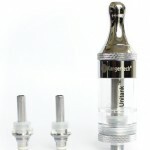 A second Apollo ProTank 2 Clearomizer can be added at extra cost. Some clones do sell for less but you do get the customer top cap for any tank fit and Apollo’s seal of satisfaction, with a 30- day money back guarantee and lifetime warranty on electronic parts. Apollo delivers everything that was missing on the VTuve V1.0 and V2.0. The VTube V2.0 saw many customers disappointed, mostly because the circuit was not upgraded for extra power. Vaping with this device is great, good performance and very stable and dependable so far. All the needed improvements can be found with this model and while there are similar clones, (LavaTube and Lambo 6.0) the Lambo 6.0 is the closest and does not include a removable top cap on the tank base. Apollo also has a strong lifetime warranty and a great track record as a solid electronic cigarette manufacturer. For more information on Apollo products, read our full review on Apollo traditional electronic cigarettes, as well as an in-depth look at Apollo Disposables, or head to the Apollo website to check out the VTube 3.0 further.